My mom read to me all the time, but especially before bed, and I had a book about a ballerina that was my absolute favorite. She jokes that she had it memorized, and still does (even though neither of us remember the title, so I am not so sure about that). After she read this book one night, we kissed goodnight and I drifted off thinking about ballerinas. That night, I had a dream that I was a dancer – a tap dancer. There were flowers thrown on the stage, the lights were hot, people were cheering, and there was a tall blonde woman in front of me moving her feet and making noise with them. I knew I was supposed to mimic her steps, but I couldn’t move. It was actually a nightmare, and I was so scared I had an accident, both on the stage and in real life. I woke up crying, and my mom rushed into my room. When she saw what happened, she soaked my sheets in the laundry tub and I got to sleep with her that night. The next morning, I asked her if I could join dance because I wanted to know how to make noise with my feet. It was the middle of the year so she thought it was unlikely, but perhaps they would let me. She brought me to Becky’s Dance Studio in Cloquet, Minnesota. We were told that there was no way I could be in recital, the dances were already started and costumes ordered, but I could be in the class anyways and not perform. My mom said that was fine, and I went to the class that day. My teacher was tall and blonde, and I told my mom it was the lady from my dream. She even stood right in front of me and would move her feet, telling us to copy her. That time, I did, and I did so well, I got to perform in the recital that May. To this day, before I perform, I think about that dream. If I did not have it or the accident, I probably would not have joined dance because then I would not have been facing my fears. I still think about four-year-old me, how far I have come, and how the urge that I might pee my pants before a performance in front of five or five hundred people never goes away, despite the fact that I have been doing it for seventeen years. I think my foundation myth relates closely with the primary source “Becoming a Brahman Priest” in Tignor’s book. Satyakama asked his mother whose family he belonged to, and she did not know. He then asked Guatama Haridrumata if he could be a Brahman Priest, and when he answered honestly that he did not know what family he came from, Guatama Haridrumata exclaimed that only a true Brahman would “speak out” like that (149). I think this relates to my experience of becoming a dancer because I asked to be one like he asked to be a priest. We also were both questioned, but ultimately given the opportunity and in some way proved that we were worthy of the chance – him by speaking out, and me by being able to remember the steps. Another founding myth in Tignor’s book was the Shang Dynasty’s. Its ruler, Tang, defeated the previous king and offered himself up to end the drought that was brought on when “the sun dimmed, frost and ice appeared in the summer, and a long drought followed heavy rainfall and flooding” (103). This is different from my story because it involves more people and the beginning of an entire empire, but it is also similar because it was a time of despair. Theirs was a little more intense, but both the Shang and I were looking for an answer to a problem that we came across, and creation myths are universal in this way. The Amazon people in the documentary we watched had a surplus of rituals and creation stories. One story that I think aligns well with mine was about this rock that they believed was a spirit that would appear in human form during rituals. Although she was in human form in my dream and real life, my dance teacher appeared before I met her. Her appearance in my dream started my dance career, and she was more symbolic and spiritual than real. This relates to our class discussions about being mindful when hearing creation stories. It may seem ridiculous that I think I dreamed about my teacher before I met her, and so might the idea that a rock can turn into a human, but we both believe it and have rituals that surround it. My mom is the one who reminds me that I was meant to be a dancer because of my dream, and it bonds us. The Amazon people also shared their stories with their children to connect on a deeper level. Without founding myths, this kind of connection would be nearly impossible. Founding myths are around us everywhere that we look, and they do have a universal purpose for humans. For one, they provide answers, but they also provide values and importance to one’s life. They are a way to preserve the memory of something that is very important to the individual, or to a mass amount of people, in an effort to see connections and have a sense of where they come from. Additionally, humans tend to read into things a lot more, so maybe the Shang were making something more of the drought, the Amazons were making something more out of a rock, and I was making something more out of a dream, but does it matter? It changed the course of our lives in one way or another, and that is what is important, not its probability or factuality. Our myths are true because they make us happy, they give us purpose, and we believe them. They are also fun to tell. To me, that is all that matters and all I need. From Professor Liang’s Spring 2017 World History I class. Works Cited, Tignor, Robert L., et al. Worlds Together, Worlds Apart: A History of the World: Beginnings Through the Fifteenth Century. 4th ed. New York: W.W. Norton, 2014. Print. What an incredible story, Alexa! Dreams are an interesting thing that have been discussed and studied for centuries yet still remain one of the greatest unanswered questions. Personally, I look to them for hints of the future, which often create moments of deja vu, similar to you seeing your dance instructor before you’ve met. I’ve never had a dream in such a way as yours, though. I think it’s interesting that you were able to see her because your brain isn’t able to create images of people you’ve never met, only of people you know, but fate works in funny ways! Yet another question to add to the pile! Thank you for sharing your personal foundation myth. One point I am particularly interested in is your quote, “both the Shang and I were looking for an answer to a problem that we came across, and creation myths are universal in this way.” The universality of creation myths really comes through in your article, and the number of connections you are able to make with other creation myths. Finding an answer to a problem is a foundational point to most stories, and I think that contributes to their universality immensely, especially considering the sort of creative adaptation myth leaves room for. Great article considering that founding myths are almost everywhere. It’s weird that when we have a dream that it can relate to use in some shape or form. Like you said you would not be dancer if it wasn’t for that dream. Because of that dream, it shaped who you are today and has allowed you to create those myths and you dance. thanks for sharing! What an incredible story for the all of us! I have always dreamed of becoming a figure skater as I watched Ice Princess from Walt Disney. The movie gave me hope and inspired me to be fun and grown at the same time. However, I do not think I was as brave as you, or it could be that my parents just did not see any use in skating. Anywho, I am glad you took the chance when you were younger to do what you dreamed of, literally. In additional, founding myths that we read of today in history books are just the latest bit of folklore in our land. There are billions of early stories that no one has ever touched base on and I think that is important to history. Thank you for sharing with us! Thank you for sharing your story Alexa! I too was once a dancer for fifteen years. It all started when I was a little girls, like you. There is something about dancing that changes something inside, which gives energy and feeling free. Experiences such as yours may be a calling to do something great, not only for yourself but later in life may have a positive impact on others. In my high school dance career I was able to give little girls their first dance experience, leaving the same mark dance had on me at a young age. These are memories that, literally, last a lifetime. The myths you mentioned are certainly a way that those memories are preserved and can be traced back to a foundation of a family, tradition, or origin. I enjoyed the connections you made to your class. Even though those stories/myths seem so different, there are connections that can be made. Those connections can be world wide and link us to places we would have never thought possible. This story resonates with me because I watched my younger sister grow up dancing and your foundational story is similar in many ways to hers. Since she was three or four years old, I remember her getting overly excited for every class she got to attend and I have vivid memories of each year’s performance. I appreciate how you paralleled your humble dance beginnings to the text and made the connections that are necessary to understand the role that myths and happiness play into the human experience. By believing in myths it seems you align that with joy, and that is a lovely and upbeat picture that you have painted for us, thank you! Thanks for sharing, Alexa. I really liked your story because I was a dancer too. I started ballet when I was three years old and danced all the way up until I graduated high school. Dance was a way for me to break out of my shell. I was a shy child, and I used dance as a way to express myself. Just like you, I got nervous before every performance, but it was always worth it because dancing was my passion. Dance has been a large part of my life, and it sounds like it is for you as well. Thanks for sharing your story! Thanks for sharing Alexa. I was a gymnast growing up, as well as showed horses so I understand where are you coming from with your nervousness for performances. However, once shows and gymnastics meets started I had never been more comfortable. I enjoyed the way that you compared your life’s experience with the text. Thank you again. Cheers! Thank you for sharing your story with us. You related your founding myth very well with the Tignor text that we have been reading for class. Founding myths are everywhere we look and I am glad you shared yours about dance. I have been in dance for 13 and I share the same feeling with you every time I am asked to perform. There is something about that knot in my stomach that makes me feel and know that I will be just fine. I use my nervousness to better myself as a dancer and to encourage me when it comes to a difficult routine. One thing that I have found in my experience is that dancers must be strong mentally, and I am glad that we have found that through myths like yours. I really enjoyed reading this article and hearing your story along with learning about founding myths. I can not think of a dream or event like the one you talked about with seeing the dance instructor in the dream even before meting her or going to a dance lesson. This article did remind me of when I was younger and learning about new places or things and how I would always imagine it in mind before ever experiencing it in real life. One case of this is when I was younger my family was going to Florida and I envisioned palm trees and sunshine everywhere with a lot of disney themed areas in my dreams. When we got there though I can remember being disappointed over the weather and the fact that a lot of the towns and the city looked like a normal Minnesota town and not what I had been envisioning all along. In class with Prof Liang we have learned that you really don’t know and understand an area until you have gone there and lived it in real life. That just goes to show that how ever you may imagine something, you really don’t know what it is like until you have witnessed and lived it first hand. Alexa, what an amazing story and experience. I find it fascinating how creation myths shape either our own personal lives or the culture we are a part of. Someone may say that this was just a coincidence, but it really does not matter if it was a coincidence or not. It is your own personal story, and because you believe it, I believe it too. From your example, I take away that creation myths not only shape who we are, but they also help us to find who we are. I also think your examples from Tignor tie in flawlessly and I especially like how you noted that creation myths can help us solve problems. Your founding myth was very easy for me to relate to. I also grew up dancing. I did dance for ten years and loved every minute of it. I may not have been the most flexible, but I still believe that it helped form the person I am today. Dance is not something I would have looked at as a founding myth but now I understand it. You related it to Tignor very well and helped me interpret your thoughts behind dance as your founding myth. Thank you for sharing! I love hearing stories about another’s childhood, because it is such an important part of our lives to reflect on. I had never heard the term ‘foundation myth’ until you presented it in this article. Your foundation myth is so interesting, and fascinating to me! The comparisons you made towards different texts from your world history class show that you understand how people from all cultures experience foundation myths in various ways. I applaud you for seeing the message in your dream as a child, and acting upon you desire to ‘make noise with your feet’. I hope that we all can learn to be brave enough like you to act upon these messages we receive at different points in our lives! This was absolutely amazing to read, thank you for sharing! I appreciated that you addressed the human tendency to read into things more and that fact and probability are not always necessary. It sounds like you were a very brave child for wishing to face your fears! It is amazing that you found something you have become so passionate about in this unique way. It is also amazing that what you found a great passion for is a type of art. I have been considering lately the ways in which all arts relate to the human capacity for empathy. How would you say you might relate dancing to empathy? Thank you for sharing! I really enjoyed your last paragraph about why myths are important to you because I can only agree. Myths are meant to relate to our lives, and that is what is beautiful about them. We can all have different experiences, but relate to the same myth. 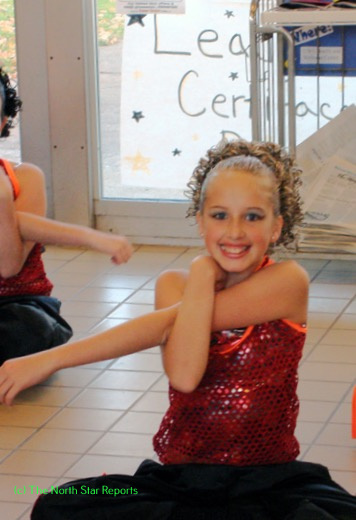 It is awesome that you knew you were meant to be a dancer at such a young age. Similarly, I have always wanted to be a teacher and am now graduating in December with an Elementary Education degree. The text we have been reading in class gives us a brief information about many different topics but some you find very interesting and would like more knowledge. Founding myths is a huge concept throughout the text and you related it perfect. I also can relate to your story by feeling the same way way when asked to perform. I get anxious and nervous and just want to do the best I can to make people proud. That weird feeling is good often times though. You always got people there to help ya out and have your back even if you do mess up on accident. I’m not a dancer but can relate by playing many sports and trying to perform in front of a crowd of 10,000 people can be nervous but use it to better myself then bring myself down. This was very interesting to read, Alexa! I enjoyed your personal anecdote in the beginning and how honest you were with it. One of my favorite books when I was young was called The Silver Slippers. It was also about a young girl becoming a ballerina and how much time she put into it. While I did not become a dancer, this book inspired me to put my all into the sports I participated in throughout my elementary and high school careers. I really liked how you compared and contrasted your personal story to the book and a documentary we watched in class. These comparisons really drove home your point in the last paragraph about how creation myths make things happen in our lives whether or not they are accurate or even true. Thank you for sharing! As I read your story I imagined you in your dream and I imagined how many of us dream about who we want to be and actually do it when we are that young. I find it fascinating that there are many kids that read a book with their parents before going to bed, and in those stories find a dream to inspire our future. I am really happy that you were able to fulfill your dreams and face your fears, as both are not things that are easy. I think it is amazing that you have been dancing for seventeen years, and I can’t imagine how much you have learned not only about music and dance, but also about yourself. Another thing that I really liked about your piece is the idea that most of us have heard stories from our parents or our ancestors and it is those stories that usually in the end make us who we are. I hope that you keep dancing the rest of your life, or at least as long as it makes you happy. Awesome story and connection, Alexa. I think the idea of facing your fears is so much easier said than done because humans tend to talk a lot with no follow through. But clearly, you followed through and followed your passion, which shows how humans have the ability to adapt and learn new things at an incredible rate. I really appreciate your determination with that first dance season being that you didn’t get to perform, I think that shows something really unique about your character. Finding something that makes you happy and that you have been told (whether in a dream or real life) to do is a great part of life. I loved this inspiring article. That was quite the dream, but ironically, it gave you the courage to go out and do it. I can definitely relate to those sort of dreams and it is crazy how much of an impact they can have on your day- or your life. I really liked how this article was written with some humor but you also got to the point. When talking about founding myths, it reminded me of rituals and how your dance recitals were rituals you would have every year. Thank you for sharing! Having the guts to take on your fear is one of the most bravest things. Some people don’t believe in signs but I do. When you get one, such as a dream, you have to go for it. As for you, it was a choice and sign that would change the rest of your life. I have been in dance since I could remember as well and the thing about it is that it teaches you so much more them how to dance. It makes you who you are. I loved your story and it brought me back to when I was little. Thank you so much, keep dancing! Thank you for sharing your experience! I thought that this was an amazing article. It is so interesting that creation myths are actually surrounding us at all times in different ways but sometimes we are so oblivious to understand that they could be considered creation myths. I am really interested in your dream it was like a premonition or vision that began your dancing career. That is something special. I really liked how you brought in certain passages from Tignor and your class to show that creation myths are different depending on your culture but in the end they allow people to bond and push people to do or believe in something new. This is a great story and I am glad that you decided to share it. Great Article! This is such a cool story! I know that I’ve had dreams that have become reality before. Nothing quite to this extent, but little events that have happened in dreams have happened in my life the next day. It’s so interesting how this happens. I also like how this one dream started a lifetime of dance for you! I know that all of the extracurricular activities that I’ve involved myself in cam from an interest, but never a dream. In a way, I’m jealous because I wish I had that sort of connection with the activities that I got involved in. This is a very interesting story! I always have these same reoccurring dreams that almost haunt me. It’s the same scary thing but I don’t understand what it means. I wish I could face my fears like you did after your dream! It’s very commendable to face your fears like that, especially at such a young age, only being 4. I have a hard time getting out of my comfort zone, so I could definitely take some advice from you. Thanks for sharing. Thank you very much for sharing your story! I know for all athletes there is one moment we can all look back on and see that pivotal point in our lives. Even though I have gone through similar experiences, to this day I still have a very difficult time breaking out of my comfort zone. For myself, it needs to be a conscious decision to not get stuck in the everyday routine. I think that everyone who reads this article will be able to find a substantial takeaway that can be incorporated into daily life, thank you for sharing! What a heartfelt story, thank you so much for sharing. I think one of the things that caught my attention was the fact that you were told you would not be able to perform in the recital and because of your hardworking and dedication, you ended up performing. It is something very respectable to be able to stick to something for as long as you did with dance. I personally believe that dreams could help you understand certain aspects of your life and in this case, it helped you follow your dream. Thank you again for sharing such a wonderful story! Thank you for sharing your story! It is interesting that dreams can be used in other situations, kind of like a “deja vu” moment. I have had many instances where I felt interested because k felt like I have “seen it before” or “been there before.” I found it interesting how you said you would not be a dancer with out a dream! For many people, their dreams kind of guide them through life and might encourage them.